A Filipino food blog. We're your tastebuds. 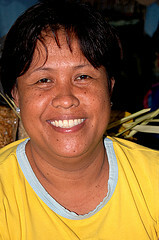 An often overlooked aspect of the Filipino gastronomical experience is that of our street food. From your typical isaw & barbeque, to your fishball & squidball, and to the bibingka and puto bungbong that is reminiscent of cool December mornings and misa de gallo. We had initially planned to write about the street food in and around University of the Philippines, Diliman, our own campus, but we decided, in the end, that we wanted to share with everyone something that is a bit less common and generic than the isaw, fishballs, etc. you find in UPD. 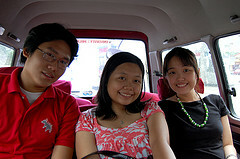 And that is how we ended up piling into Harrell’s van for a mini roadtrip to Antipolo. From UPD, Antipolo is about a 40-minute drive away, if there is little to no traffic. Antipolo, like most provincial cities and towns, has rather narrow roads. Parking is a bit difficult and while there are a lot of friendly townsfolk willing to help you find a place to park, most of them will invite you to buy their wares, which is what exactly happened to us. We didn’t mind so much, however. We figure that, at least, we help them earn a bit more money, even if we do buy from them out of a feeling of “I scratch your back, you scratch mine”. 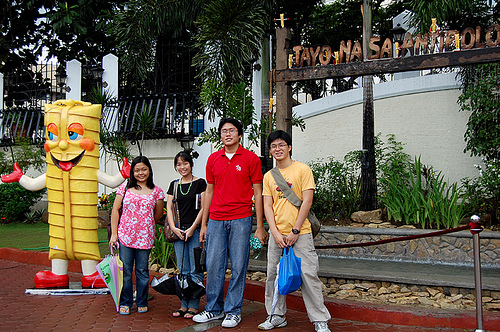 After paying a quick visit to the famous Antipolo Church, we trooped over to the Pasalubong Center located conveniently near the church. You can find kasuy and suman in just about every street corner, but the vendors who have booths in the Pasalubong Center boast the widest selection of food stuffs. We were rather overwhelmed by the number of vendors and booths, so we decided to pick the vendor who gave us the friendliest smile. We explained to Manang Vangie that we were there to write an article on Antipolo street food and she was more than willing to answer our questions and walk us through her wares. Walking back to our vehicle, we passed through the newly constructed park/plaza (formerly the parking area in front of the church), where there were even more booths. The booths here were per barangay, each selling their own signature products. We bought some sapin-sapin and what the girl called putong bungang-kahoy (something none of us have tried or heard of before). We have to mention this display at the center of the park/plaza of a wooden structure bearing the words “Tayo Na Sa Antipolo” with little suman men running around it and the Mr. Suman and Ms. Kasuy statues flagging both ends of it. We found both of these extremely amusing, and couldn’t help but stop to take some photos with them. More than the amusement, we’re very glad for Antipolo, that they’re investing more on their tourism. 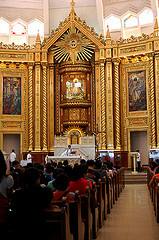 Especially so, now that it’s May and many people are heading to Antipolo to visit the church. 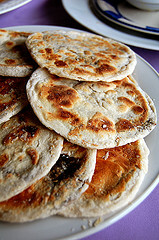 Piaya, or brown sugar pie, is flat, flaky, unleavened bread filled with muscovado (raw, unprocessed) sugar. This is actually a product of Bacolod, but the Foodistas are rather fond of piaya, so we decided to give the sort made in Antipolo a shot. It was thinner than your typical Bacolod piaya and it didn’t have sesame seeds sprinkled atop it. Although the filling was definitely less than the usual, this was still very good. We’ve honestly never went wrong with any sort of piaya, though. Antipolo’s suman is easily one of the best we’ve all ever had. 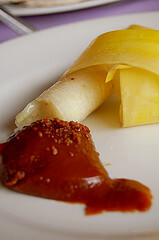 One thing about suman is that it’s rare that you encounter one so good that you can eat it all on it’s own. This one, though, was so good that we can be perfectly content eating it without feeling the need for extra sweetness/flavour. We, of course, had ours with coconut jam. 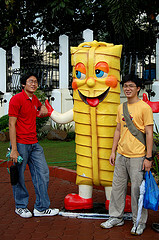 In Joey’s opinion, it’s the best way to have your suman: Spoon a bit of coconut jam on to your suman and bite into it – sarap! The homemade coco jam from Antipolo is not as sweet as most coco jams tend to be, and it had a very thick, sticky consistency. Like the suman, it’s perfect all on its own. This is the kind that you can put on just about anything: from suman to monay and even to sapin-sapin (we kid you not – Harrell tried it out of curiosity and he liked it). Sapin-sapin, like suman, is one of the more popular Filipino desserts/kakanin. 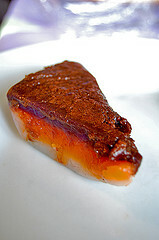 It consists of three flavoured layers of sticky rice cake: typically ube, kutsinta and macapuno. 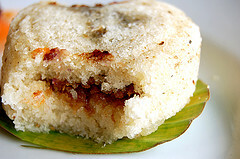 It’s then topped with latik, which is basically what’s left of the coconut once you’ve extracted its oil. The one from the Barangay Dalig booth wasn’t as sweet as most sapin-sapin we’ve had before and there was a generous layer of latik on top. This was only Php 5 a slice – very cheap! 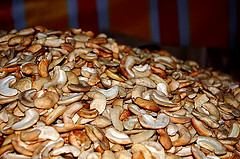 The kasuy (cashew nuts) of Antipolo were also one of the best we’ve ever had. They were wonderfully roasted and thankfully unsalted. Tiffy says she can eat bags of these at a time, if she could, especially since they were without any additional flavourings. Putong bungang-kahoy was probably the one low note of our experience. It smells rather funny (earthy and slightly pungent) and it was hard, dry and tasteless. The filling of caramelized dessicated coconut was a bit dodgy. Kat found the filling was too strong. Bong says he liked the idea of it, but the execution wasn’t so great. We had tonnes of fun doing this feature of Antipolo street food. The weather was perfect, if a bit rainy in the beginning. The trip there was a bit of an adventure and the company was, of course, great. If you’re contemplating going on a day trip, we definitely think you should consider going to Antipolo, if you want a change from the usual Tagaytay, Laguna or Batangas options. Thank you for having us, Table for Three, Please! ? Foodistas present: Bong, Harrell, Joey, Kat and Tiffy. It's one fun gastronomical trip for us, and we surely enjoyed everything! Well, we don't usually go to Antipolo (except for Joey siguro...hee.. :3), but this made it happen, and I'm glad we did :) Thanks! Haven't been to Antipolo in years!! 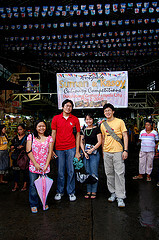 I super remember the casuy and the suman!! you should have gone to this new place in antipolo, SIZZLIN'OPIA. They have the perfect ambiance if you want to feel a bit boracayish. They serve the best steaks, bbq/treyaki-chicken, bbq/tereyaki-pork, bbq/tereyaki-beef and theee most yummy bbq-ribs! 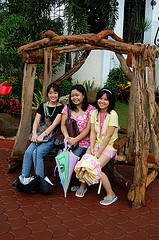 Haven't been to Antipolo. 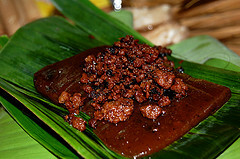 I am intrigued by the these delicacies, especially the suman with coco jam and the kalamay. I am used to seeing kalamay inside a coconut shell. This is my first time to see one wrapped in banana leaf, which I think is less messy since it doesn't stick to the leaf. Table Conversations: Where are We Eating? © 2019 Table For Three, Please. All Rights Reserved.